Many solid waste companies and municipal landfills have the situation well in hand; do you? Birds, mammals, and reptiles can be injured or killed by the trash we throw away. The magnitude of the problem is growing every day, especially because some types of litter do not readily disintegrate and therefore remain in the environment as a threat for decades. To help protect wildlife and natural habitats, local cleanup campaigns and recycling plans are now being implemented. 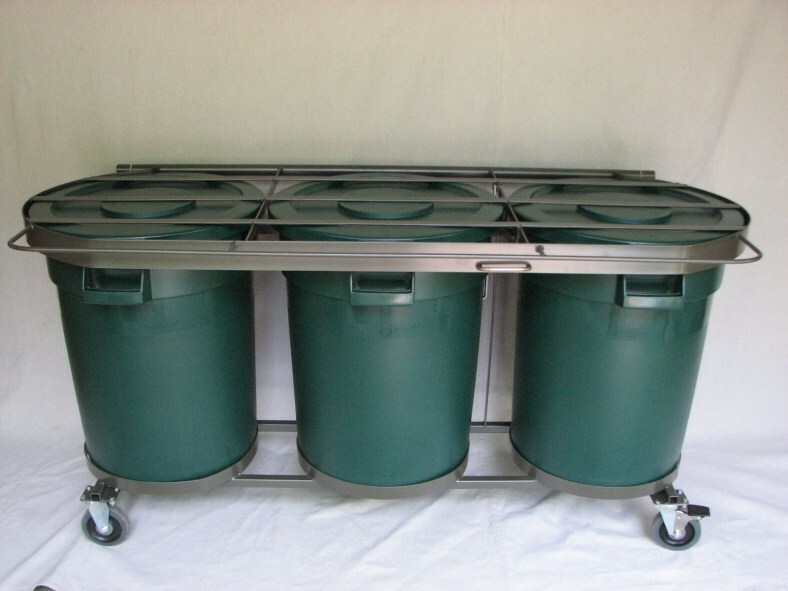 For more information about the Trash Knight system, please visit our website at www.trashknight.com. The amount of litter that ends up spoiling the beauty of the natural environment is not surprising considering the amount of waste we produce. Glass bottles, plastic packaging, tin cans, newspaper, cardboard, and other types of garbage litter urban and rural landscapes everywhere. According to Wildlife Fact File, about 160 million tons of trash is thrown away every year in the U.S. or approximately three and a half pounds per person each day. Paper products alone account for over 40 percent of this garbage. Sometimes the wind blows trash from overloaded garbage cans and litters the environment. Naturally litter can last for a long time depending on the disintegration of the garbage. For example aluminum cans do not disintegrate, and some plastics take decades to break down. Litter can be very harmful to wildlife. Discarded fishing lines can trap the legs, wings, or neck of waterfowl such as swans or moorhens. A fishhook may get stuck in a bird’s throat. Water birds suffer lead poisoning when they accidentally swallow small lead fishing weights. Broken glass can cut the feet of foxes, coyotes, or badgers, and unbroken bottles present a hazard to various small animals. Lizards often crawl inside bottles or cans to bask warm interior, to seek protection or search for food; but they may find it difficult to squeeze out again and can die of overheating. Small mammals in search of food often get their heads caught in the openings of jars. Replacing lids on bottles and jars before discarding can help prevent animals from becoming entrapped. Birds, fish, and mammals may be ensnared by plastic six-pack holders. This can be prevented this by cutting up the plastic rings so that they do not become traps. Litter may appear to be helpful to wildlife. At night in some urban areas, foxes look for garbage on the streets. Often they feed on chicken bones, pieces of hamburger, and other leftovers from fast-food meals. During the day pigeons take over from foxes, these birds often flap around a food-laden garbage can of peck crumbs on the pavement. Gulls are well-known scavengers. These birds have greatly increased their number by feeding on thrown-away food. Inland, they gather in flocks over garbage dumps, where they eat even the filthiest scraps. Human food is not necessarily good for wild animals. Deer, for instance, love bread and sweets. These purified grain products may form gummy masses in the stomachs of ruminants and interfere with digestion. Deer may actually die from ingesting too much food with a flour base. Discarded food can also become contaminated with microorganisms that cause food poisoning. More likely, however, the wild animals will become accustomed to free handouts and be unprepared to hunt for themselves if the source of human food is cut off. There was a time when many animals fell victims to discarded trash in municipal dumps. In addition to the waste itself, wildlife was threatened by heavy equipment workers who did not understand how their actions could threaten a fragile ecosystem. Animals were often struck by trucks or crushed by heavy machinery. Some became entrapped in trenches, open pits or pipes. While dumps still exist in some remote locations, most are being replaced by sanitary landfills. The evolution of sanitary and secure landfills was accompanied by environmental planning that provided protection for wildlife and guaranteed that the land would be reclaimed for future wildlife inhabitants. Some methods of protection seem to be standard procedures at most landfills and many facilities have some pet project designed to provide for the safety and continued survival of some special creature. Butterfield Station in Phoenix, Arizona serves as a good example of what precautions are normally taken at Waste Management Inc. (WMI) owned and operated landfills. The landfill is securely fenced to exclude many animals. 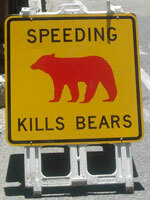 Strict speed limits are enforced to protect animals from being hit. At the close of every day, all refuse is covered with a six inch covering of soil to keep animals from being injured by the debris. All truck beds and other such containers are covered with tarps to keep animals out. Domestic animals are not permitted in the landfill. Any escaped debris is collected from roadways and along the perimeter of the landfill on an on-going basis. 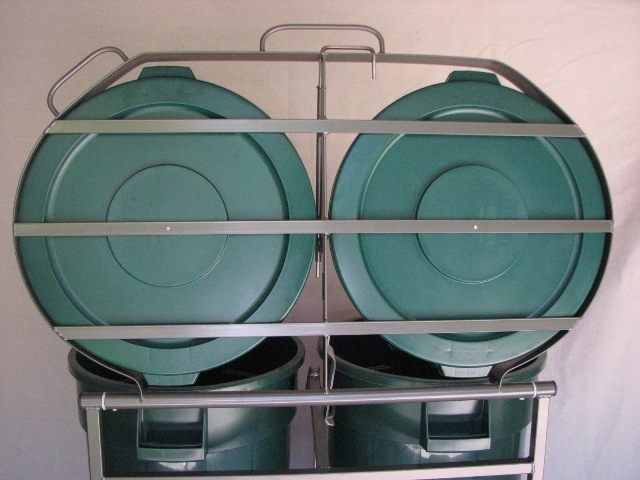 Small waste containers are provided with animal proof lids to keep wild animals from getting to the waste. Many Waste Management facilities provide special roll-off containers for small towns and villages to use during community clean-up events. It is common for landfills to have pet projects to protect individual species that are of particular concern. Kirby Canyon Recycling and Disposal Facility in Morgan Hill, CA with help from the U.S. Fish and Wildlife Services, City of San Jose, researchers from Stanford University and consulting biologists have embarked upon a conservation plan to increase and maintain the population of the endangered Bay Checkerspot Butterfly. Approximately two hundred and fifty acres have been set aside for the checkerspot, which was nearing extinction in 1985. The Kirby Canyon Conservation Agreement, which celebrated its 10th anniversary in 1996, provides for: the setting aside of land; establishment of a trust fund for studies of the butterfly; management of cattle grazing to ensure appropriate balance of plant resources; habitat restoration and enhancement; and ongoing scientific monitoring of the Bay Checkerspot population. In addition, Kirby Canyon has set aside marshland for the preservation of the endangered Red Legged Frog. Altamont Landfill and Resource Recovery Facility in Livermore, CA has implemented a special program to protect the endangered San Joaquin Kit Fox. The protection program includes many projects to protect the San Joaquin Kit Fox. Exclusion zones are placed around dens. Limited disturbance of areas adjacent to construction and storage areas must be maintained. Escape ramps are constructed in all holes or trenches greater than 2 feet deep, and sides must have a slope no greater than 45 degrees. Pipes with a diameter of four inches or greater must be inspected for kit foxes before being buried, capped or moved. Vehicles observe a 20 M.P.H. speed limit except on county, state or federal roads. Staff and visitors are instructed not to harass any Kit Fox or other unidentified fox in the vicinity of the landfill. Feeding of wildlife is not permitted. Off road traffic is prohibited. General precautions that are followed at all landfills are observed at Altamont. The Kettleman Hills Facility in Kettleman City, CA also has protection programs for the San Joaquin Kit Fox, Giant Kangaroo Rat, the Blunt Nosed Leopard Lizard, the San Joaquin Antelope Squirrel, and two state species of concern, the Burrowing Owls and badgers. 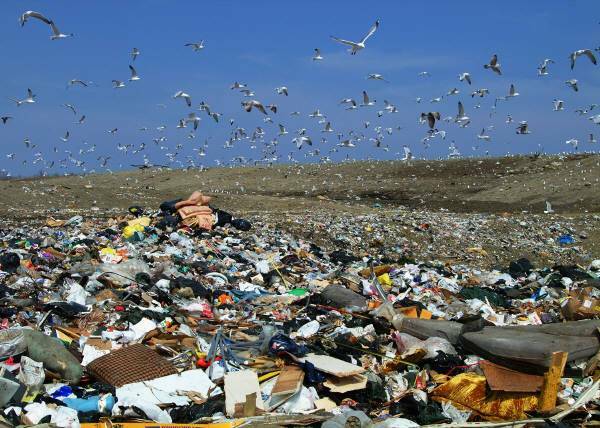 Landfills have made great strides in protecting wildlife. But everybody must become involved in protecting wildlife from household waste. Recycling reduces the litter problem. Improvements in package construction can reduce unnecessary waste and make them less harmful to wildlife. Proper disposal methods can help to keep litter that we accumulate from becoming a death trap to wild animals. 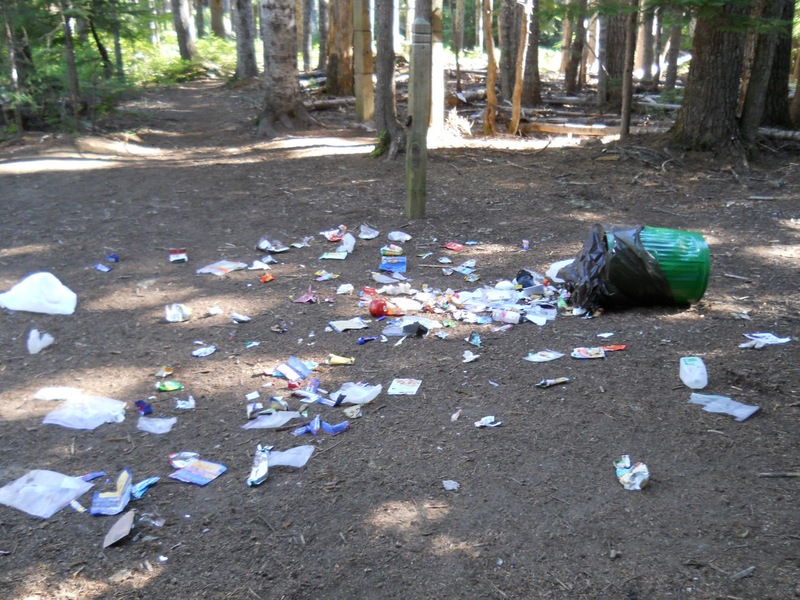 If people learn to respect the environment and are aware of the threat trash poses to wildlife, they will be less likely to litter. There are many things that your clubs, science classes and families can do to help protect animals from being injured by trash. Below are some ideas. Look at the products your family uses. Is there a lot of extra packaging that is not needed? Tell the company by letter, phone or e-mail. They have offices set up to handle such concerns. Don’t buy from companies who refuse to reduce unnecessary packaging. Check the trash that your family discards. Does your trash get placed in an animal proof container? That will help protect animals. It is still wise to check each item that you discard. What packages could injure animals? Cut up or tie plastic bags and six pack holders into knots to prevent injury to small animals. Remove can tops completely. Seal food in leak proof bags. Put lids on bottles and jars, or plug holes before disposing of them. Better yet, make community clean up a routine. If you see trash in a field or along a road, pick it up (wear gloves or some other hand protection). Teach others about the need for protecting animals from trash. 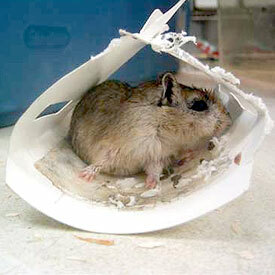 Use critter-proof trash containers. Click here to be directed to our Trash Knight resources and links page for ordering information. For more information about the Trash Knight garbage system, please visit www.trashknight.com. 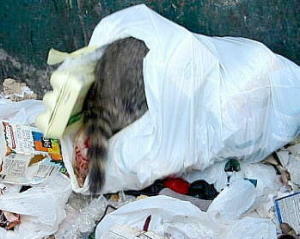 Animals Getting into Your Outdoor Garbage Cans? Not everyone has a garage or shed in which to store garbage cans until trash day, and when garbage cans are stored outside, inevitably animals looking for food get into them. Lids offer some protection, but even lids don’t always keep out hungry animals. Dogs, which are usually larger and stronger than most trash raiding culprits, knock over cans and scatter garbage all over the ground. Cats create a hole in the trash bag and gingerly pull out what they want, one piece at a time. 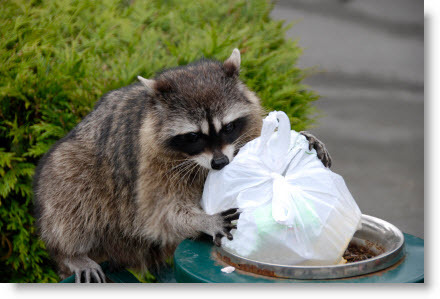 Wild animals such as raccoons and opossums get into the garbage too, and they find what they want anyway they can.If you are forced to store your garbage cans outside, there are ingenious but easy ways to keep animals out of your trash until garbage day. These methods won’t harm the animals, and trash collectors won’t end up with chemicals or soap all over their hands. Try these ideas if you are having a problem with animals in your outdoor garbage. You won’t have to pick up household garbage from the ground again. People sometimes pour strong chemicals such as bleach or ammonia on outdoor garbage in an effort to keep dogs, cats, opossums, raccoons, and other animals out of their garbage. These products might temporarily repel animals, but garbage handlers don’t appreciate having ammonia, bleach, and other chemicals on their hands and clothes. There are options other than messy soaps or strong chemicals that work to keep animals out of the garbage. More importantly, don’t resort to shooting or poisoning animals that look for food in your garbage cans. Every living creature must to eat to survive, and it isn’t the fault of the animal if they are homeless or their owner lets them roam the streets. If you know where a particular animal originates from, contact the owner, and respectfully explain the problem. If politely confronting the animal owner doesn’t work, contact your local dogcatcher. Animals allowed to run the streets are sometimes the unfortunate victims of cars, guns, and poison. You’ll be doing an innocent animal a favor as well as yourself. If your garbage cans have handles, drive stakes into the ground where they are stored, and run the handles through the stakes. This will prevent animals such as large dogs from knocking the cans over. This along with the following ideas for keeping animals out of outdoor trashcans, might eliminate any further problems with animals getting into trashcans. 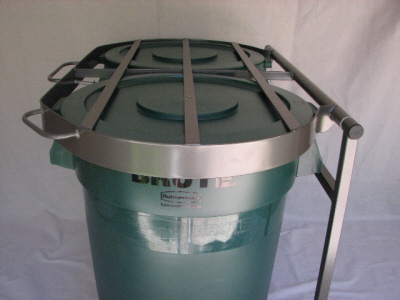 Bungee cords can be very helpful in keeping lids on trashcans. Connect bungee cords together if necessary, and secure the lids by threading the bungee cords through the handles. Bungee cords are also helpful in keeping trashcans in an upright position. Connect bungee cords, and wrap them around more than one can. Animals trying to knock the cans over will have a difficult time when they are connected. Alternately, if you have a fence, consider using bungee cords to secure garbage cans to the fence. If an animal can’t knock them over, the lids are less likely to come off, and they’ll be forced to go foraging elsewhere. If all else fails and animals are still getting into your outdoor garbage cans, consider building a box to house trashcans. Build the box from strong plywood, and make a lid with hinges and a hasp. You’ll not only hide unsightly trashcans, but you’ll never again have to pick up trash from the ground because of animals getting into the garbage. For more information about keeping critters out of the trash or to learn more about our Trash Knight garbage system, please visit www.trashknight.com. We’ve all been there. You actually remember to take the trash out on trash night. What a feeling of accomplishment, relief and satisfaction. Now you don’t have to worry about racing down the driveway in the morning and being late for work. Morning comes and you’re getting ready for your day. Time flies by quickly, especially if you have little ones to get to school or a lengthy commute. As you race out the door, you are met with a most unpleasant sight. The garbage you so carefully placed out the night before is now laying all over your driveway, lawn, neighbor’s lawn, neighbor’s driveway, and a good portion of the street. At some point in the evening some of the following may have visited your house. 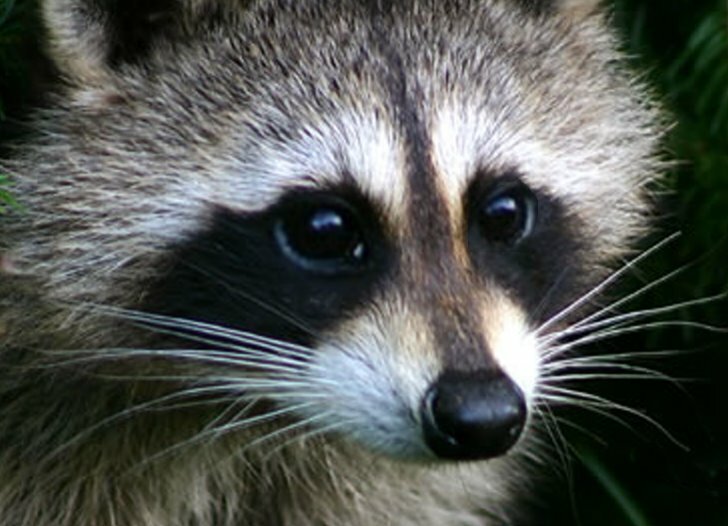 Raccoons are common inhabitants of urban and semi-urban areas. Because local ordinances provide raccoons with near-total protection in many areas, dealing with damage or nuisance situations in those settings presents some unique problems. Homeowners having a problem with raccoons in garbage should store the garbage in a stout metal or plastic container and close the lid tightly. It should be wired, clamped or tied shut if necessary. If the problem persists it may be necessary to tie the can to a post or other solid object to prevent it from being tipped over, or to put the garbage cans inside the garage or outdoor shed. Raccoons may be attracted by dog or cat food left out overnight, and it may be necessary to feed pets indoors or to provide food only during the day. 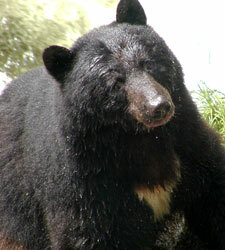 Conflicts between people and bears have increased as more people build homes and cabins in rural areas. 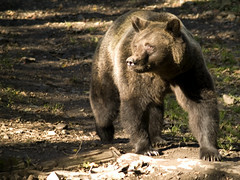 Conflicts between people and bears arise when bears damage personal property, beehives, livestock and agricultural crops. A bear will take advantage of any foods available and will attempt to eat anything that resembles food in look, smell or taste. When natural foods such as nuts, meat berries, insects and tender vegetation are scarce, bears search actively for anything to eat. This is when bears most often come in contact with people. 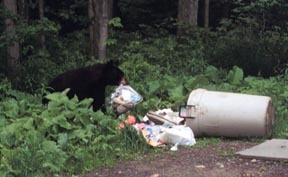 When bears find a source of food they will usually return regularly. The best way to prevent this situation from occurring again is to have a proper garbage containment system in place, such as the Trash Knight. Check us out…you’ll be glad you did.